Learning and mastering the guitar’s fretboard is an arduous task. It requires tremendous concentration over extended periods of time and pig-headed determination to truly master the guitar’s fretboard. The fastest way in my opinion to master the neck is to say and play whatever you are busy learning at the moment. As an example, let’s say you are memorising all the E minor/major 7 arpeggios across the guitar neck. 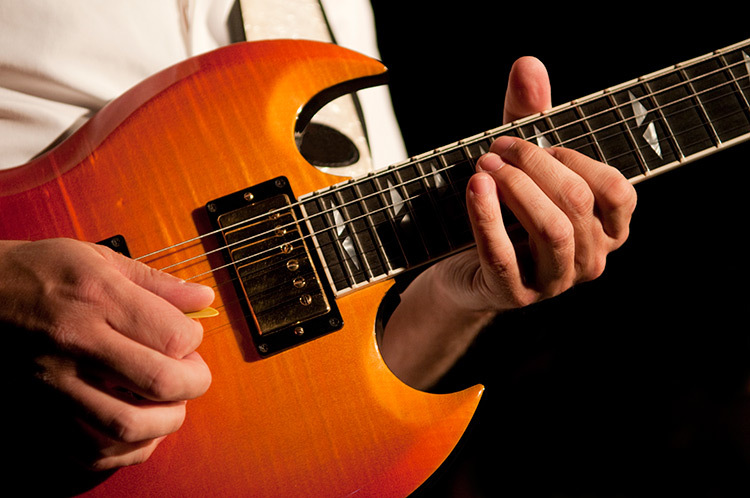 I would recommend learning the arpeggios in each of the five natural positions of the guitar. Yes, it will require extra work from you and you may feel: “What’s the point of saying it, I can just say it in my mind’s eye?”. Well through thousands of teaching hours I have realised that saying (aloud) and playing is perhaps one of the most effective ways of becoming a better player fast! By saying and playing you internalise the material so much quicker than the traditional route of just playing. Whenever I teach my students sight reading, I require all my students to say the notes prior to playing them. After that task is complete, we then play AND say the notes to internalise them! I love doing a very thorough job and when I teach it is my responsibility to make sure I do EVERYTHING in my power to help my students become the best that they can possibly be! Say next time you practice a passage/scale/lick, why not try the technique of PLAYING AND SAYING! I guarantee you that it will bring breakthrough in your playing! It will be hard work, but if you want results you will have to put in the right amount of time and effort to justify the reward that you are after!